A Bristol native, Gary wrestled and played golf at Bristol Central where he was an All-CCIL pick as a member of the class of 1975. He went on to play golf at Stetson University, lettering all four years and serving as captain in his senior season. He was the team MVP and had the lowest stroke average in his sophomore, junior and senior seasons. The golf pro at Chippanee Golf Club, he played in the GHO in 1987 and in the National PGA Championship in 1991. In 1994, he received the Connecticut PGA Merchandiser of the Year Award for a private golf facility. He is a certified club fitter for Ping, Titlist, Taylor-Made, Calloway and Cobra Golf companies and in 2002 was selected the Ping Golf Company Regional Club Fitter of the Year. 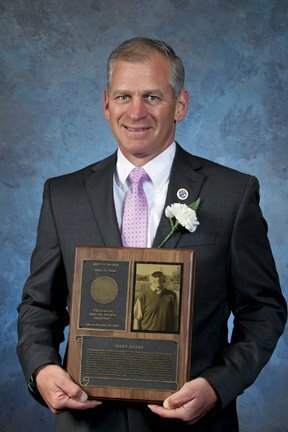 He received the 2004 CT PGA Junior Golf Leadership Award for outstanding contributions to the promotion and development of Junior Golf in the state. In 2009, Gary was recognized by the Bristol Tramps. He has introduced over 1,000 individuals to golf and has students ranging from age five to 87 years of age. In 2014 he received the Bill Strausbaugh Award and in 2018 he was voted “Professional Of The Year” by the Connecticut Section of the PGA.